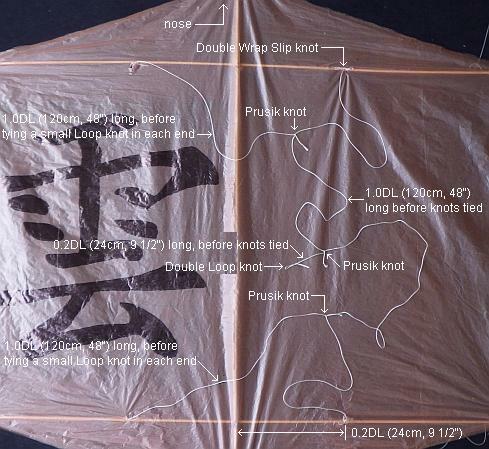 Make sure the Prusik knots closest to the kite are adjusted to the middle. Right over the vertical spar. 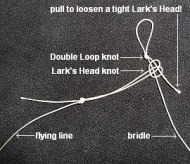 Referring to the diagram below, shift the highest Prusik knot to the shown position. It's not necessarily the perfect position for your individual kite, but it should at least fly on the first attempt! Later, you can experiment with shifting the position towards or away from the nose, a little at a time, to improve how high your kite flies. Check the bridle slip knots on the horizontal spars. Re-tighten if necessary, or put a small drop of wood glue on each so they can never come loose. You won't have to wait the full drying time for this glue to dry, since the amounts are small. Firstly, if it's very windy outside, stay home! 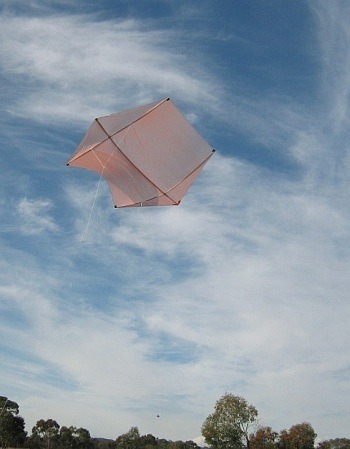 This is a light-wind kite and won't like being launched in a gale or even a fairly fresh breeze. If the wind is too strong, it will deform badly and refuse to fly properly. Another approach is to get a helper to hold the kite up and let it go, on the end of 10 or 20 meters of line. This way, the kite soon gets high enough to make it easy to let more line out. Have fun flying, and I hope you've enjoyed learning how to make a Rokkaku kite! Rokkaku kite stories of my real-life flying experiences are worth checking out!